Social media is a place where we get to see some interesting things and at the same time some bizarre ones. Recently a video of a Brazilian woman Silvia Grecco, narrating a football match to her blind and autistic son Nickollas, went viral on social media and won hearts of many. 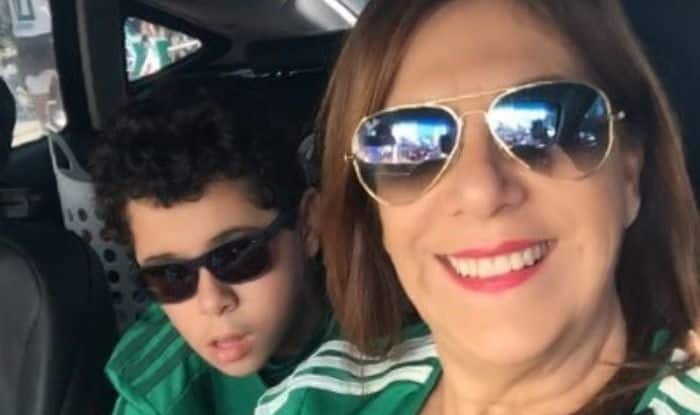 Silvia (56), passionate Brazilian football fan grabbed nationwide attention after a video of her narrating her local team’s football matches live to her son Nickollas (12) circulated online. The mother-son duo were spotted last year on television narrating one of Sao Paulo team Palmeiras matches from the stands. “I describe details: this player is wearing short sleeves, the colour of their football boots, hair color,” AFP quoted Grecco (56) as saying. After a recent game between Palmeiras and Botafogo de Ribeirao Preto, Grecco said, “My narrating is something of my emotions. I’m not a professional.” She further went on to say, “Everything I see and feel, I tell him, even when I need to curse the referee!”. Nickollas’ father and sister, on the other hand, are supporters of other teams. To avoid family divisions, Grecco resorted to the skills of none other than the boy’s idol, PSG star Neymar when they met at an event. “Neymar lifted him on his shoulders and he passed his hand through Neymar’s hair, it was a big moment! So I asked Neymar what team he used to support as a child, and he said he was a Palmeiras fan!,” Grecco said. “So I said ‘Do you see, Nickollas? Your mother, your player … I think your team should be Palmeiras,’” she added.